These dice sheets cover things from listening questions to rhythms to note names. I use them in my classroom for games and for discussion. 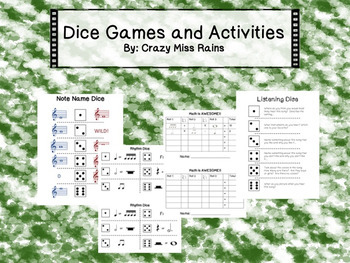 This .pdf file includes 4 different note name dice sheets, 5+ different rhythm dice sheet variations, 3 different listening question dice sheets, and two math game sheets to play with the rhythm dice sheets. I have included a few different games that I play with my students as well as a couple suggestions for composing as well. I use these mainly with my 2nd-5th grade students! This can be a great addition to your arsenal for teaching general music.